Sporades are a group of islands in the east coast of Greece. 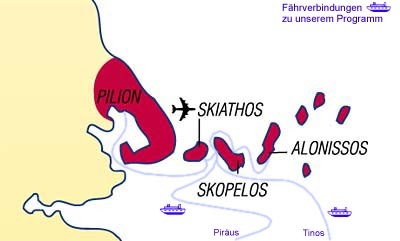 There are a number of islands in this group and only 3of them (the biggest ones) are habited, Skiathos, Skopelos and Alonissos. All of islands are known for their beauty, green nature and their amazing beaches but each of these has its own beauty and charm and has something unique to offer. Skiathos is certainly the most famous island of the Sporades. The south coast is peppered with pine-fringed coves with long stretches of golden sand and a wealth of water sports and beach activities to satisfy all ages and tastes. And when night falls there are music bars and discos. Skopelos and Alonissos, the neighboring islands, are recommended for those who search for peace and quiet. The beautiful Pelion peninsula with stunning scenery, luscious nature, silky sandy beaches, crystal clear sea, the snow capped mountain, spring water falls, and winding cobble-stoned paths. In high season there are many boat connections between Skiathos, Skopelos and Alonissos and to the smaller neighboring islands and Pelion also.